Think of Historic Jamestowne as the original, the real McCoy (hence the extra “e“ as the colonists would have written it). Run by the National Park Service, it includes Old Towne, New Towne, The Glass House, and the Loop Drive. Scroll down for a list of free days to visit and an itinerary for visiting Jamestown, Yorktown, and the ferry! On our last trip there, the weather was spectacular. August in Virginia can be humid (c'mon, it's the South! ), but there was a fabulous breeze coming off the James River that made it very comfortable. We decided to do a one-two punch: take advantage of the combination ticket and visit both Yorktown Battlefield and Historic Jamestowne on one day for just $14 per adult (the kids were free!). 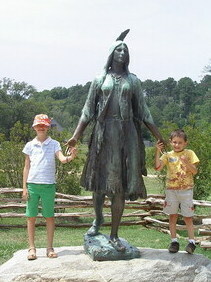 The Pocahontas statue at Historic Jamestowne. Now, both Historic Jamestowne and Yorktown Battlefield (which are run by the National Park Service) are sometimes seen as the "poor cousins" to the more expensive and glitzier Jamestown Settlement and Yorktown Victory Center. So we weren't sure what to expect...or whether the kids would find it boring. Boy, were we pleasantly surprised! For $28, our family of four enjoyed hours of fun, history, intriguing exhibits, and beautiful scenery at TWO different historic sites. What a bargain! We started with the newly-updated 15-minute film about the colony’s beginnings 400 years ago. Set in a unique, round, IMAX-type theater, the film debunked Disney myths about Pocahontas. (Nope, no romance with John Smith, unless he was a cradle-robber...she was only 11). 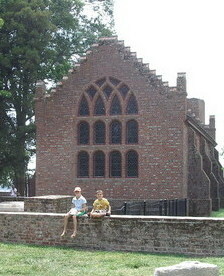 Jamestown Memorial Church at Historic Jamestowne. After a quick tour through an indoor exhibit of artifacts (cool for mom and dad, but not interesting enough to tempt the kids), we went outside. The boardwalk leading to the historic site leads you over a swamp full of fascinating creatures like herons, snapping turtles, and osprey--if you look carefully. We wandered out to Jamestown Memorial Church. The church itself is only about 100 years old. But to get to it you go through a brick tower built in 1690, the only surviving seventeenth-century structure at Jamestown. A gorgeous day, like we had, is the perfect time to stroll along the riverfront and snap pics with statues of Pocahontas and John Smith (who was apparently a nastier character than Hollywood has painted him). We then stopped by an active archaeological dig, where an archaeologist was digging through trash...literally. He was excavating a colonial trash pit, and had just found a two to three hundred-year-old wine bottle. To date, they've dug up over 1 million artifacts, including bits of buckles and pottery. 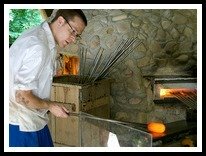 The glassblower at Historic Jamestowne. Our favorite part was the Archaearium, an indoor exhibit hall built over colonial ruins. It's packed with artifacts, ranging from arms and armor, medical instruments, and tools, to musical instruments, games, and food remains. One of the oddest facts we learned was about horses. The colonists transported horses in the bowels of the ships in slings suspended from the ceiling, leaving the horses' legs dangling freely. Otherwise, the horses might have broken their legs during heavy seas during the three-month voyage. Who was the first German in America? German physician and botanist Johannes Fleischer was one of the original 1607 colonists in Jamestown. Fleischer was also the first university-educated individual in America. German glassmakers arrived at the fort in 1608, and quickly built glass furnaces, a recreation of which can be seen today. They also created the first industrial products in the New World, conducted experiments with metals, and brought German copper coins which they traded with the natives. Historic Jamestowne is open daily except for Thanksgiving Day, Christmas, and January 1. The front gate opens at 8:30 am and closes at 4:30 pm. Once you're in through the gates, you can stay until dusk. Admission is $14 per adult. Keep in mind that the tickets get you into Yorktown Battlefield for free (it's a 20-25 minute drive). All youth 15 and under are free of charge. All things considered, it's considerably cheaper than Jamestown Settlement. Tickets are good for seven consecutive days. Holders of the National Park Service Golden Eagle Pass and members of APVA-Preservation Virginia are admitted free. There are also a variety of combination ticket packages available at the Visitor Contact Station. President's Day Weekend - mid-Feb.
My recommended itinerary: You probably want to allow 2-4 hours at the site. 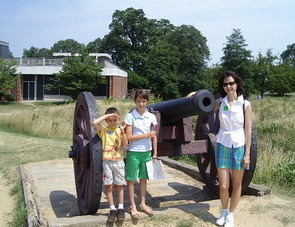 We bought tickets at Yorktown Battlefield, and spent a few hours there touring the museum and the town of Yorktown. We then drove over to Williamsburg, where we had a delicious but inexpensive lunch at Pierce's BBQ. Next, we headed over to Historic Jamestowne, spent about 3 hours touring the site, then hopped on the nearby Jamestown-Scotland Ferry on our way to Grandma's house on the Surry side of the James River. Aside from being a fun (and free) diversion, the ferry provides a spectacular river-view of the ships at Jamestown Settlement, as well as Historic Jamestowne. Don't miss other local attractions. Here's how to get discount tickets to local attractions like Colonial Williamsburg, Great Wolf Lodge, and Water Country USA. Jamestown makes a great day trip when you're staying in Virginia Beach too. Jamestown, Virginia, is one point on the "Historic Triangle" it forms with Williamsburg and Yorktown. Just a ten-mile drive along the scenic Colonial Parkway from Williamsburg, it's also a short drive from Yorktown. In summer, you may want to skip the traffic and take the free Historic Triangle Shuttle bus, which provides service between Jamestown, Yorktown, and the Colonial Williamsburg Visitor Center. It's available every 30 minutes 9 a.m - 3:30 p.m. April 1 to October 31. Jamestown is approximately a 30-minute drive west from Newport News/Williamsburg International Airport, about 1-1/4 hour west of Norfolk International Airport, and about 60 minutes east of Richmond International Airport. Here's a link to a Google Jamestown map. Historic Jamestowne is a 10-15 minute drive from I-64. Traveling from the Virginia Beach/Norfolk/Hampton area? Go west on I-64 and then take Exit 242A. Follow Route 199 for five miles, then make a left at the fourth stop light onto Jamestown Road. About miles south you'll see the signs. Pass Jamestown Settlement on your right and follow the signs for about 1/2 mile (you'll pass the Glass House on your right). Turn right into the museum parking lot. There is no charge for parking.